"Superior picture quality is the hallmark of our award-winning line of DVR systems, and the sideKick HD is the latest example, delivering the pristine output and flexibility producers expect while making life much easier for post-production editors," said Paul DeKeyser, founder of FFV. "With the sideKick HD, camera-to-editing workflows have never been more streamlined. Instead of using the camera's on-board recording device, users can capture video directly from any HD/SDI or HDMI output and choose the final post-production codec without any additional transcoding — saving valuable time and removing steps that could degrade image quality." The new sideKick HD offers high image quality in a camera-mountable recording solution. Although today's state-of-the-art camcorders offer superior image sensors and high-quality interchangeable lenses, their internal recording capabilities are typically lacking. While most camcorders are capable of delivering a data stream of only 30 megabits per second at 50:1 compression, the sideKick HD is able to record at 220 megabits per second at only 7:1 compression, providing higher image quality for the "camera original." The sideKick HD attaches to any HD camcorder or HDSLR using a standard ?-20 mount. As a true straight-to-edit DVR, the system records to off-the-shelf, hot-swappable 2.5-inch SSD drives in native ProRes (for Apple® Final Cut Pro®) or DNxHD (Avid®) NLE formats. Bringing files into the NLE environment is a simple matter of moving the disk from the sideKick HD to the computer; no time-consuming ingest or transcoding operations are required. A 4.3-inch on-board confidence monitor offers playback options including scrub and jog capabilities. To simplify power management, the lightweight sideKick HD is intended to be powered from the camera's battery. FFV offers power cables for direct connection to Anton-Bauer and IDX camera batteries, as well as approved OEM-compatible batteries with a DC output for Sony, Panasonic, Canon, and JVC camcorders. In addition, FFV offers a battery pack option that extends the full power of the sideKick HD to users of smaller cameras that are not equipped with full-sized batteries. On remote location shoots, these users will have the ability to unplug a discharged battery and replace it with a fully charged one without interrupting a sideKick HD recording session. 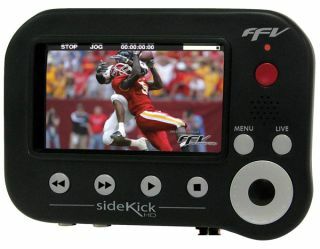 At the 2012 NAB Show, the sideKick HD will headline FFV's full line of DVR solutions.